THEY in Windy City Times — “a secret society … not in keeping with gender norms” — What if you could meet a secret society of welcoming misfits—omitted from patriarchal biblical history—just because they are not in keeping with gender norms? to read the entire review in Curve, click here. 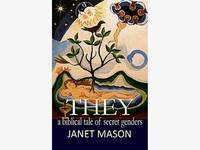 I was very honored to learn that my novel THEY, a biblical tale of secret genders (Adelaide Books — New York/Lisbon) was reviewed by none other than Amos Lassen, the biblical scholar and LGBTQ icon. “I hope the story lets everyone know that religion/spirituality is open to them,” said Janet, “whether or not they chose it. The story was in part inspired by a young woman who lived on my block and whose child transitioned genders at an early age. A few years ago, this young mother left her church in tears after a rather judgmental remark from another congregant. Mt. 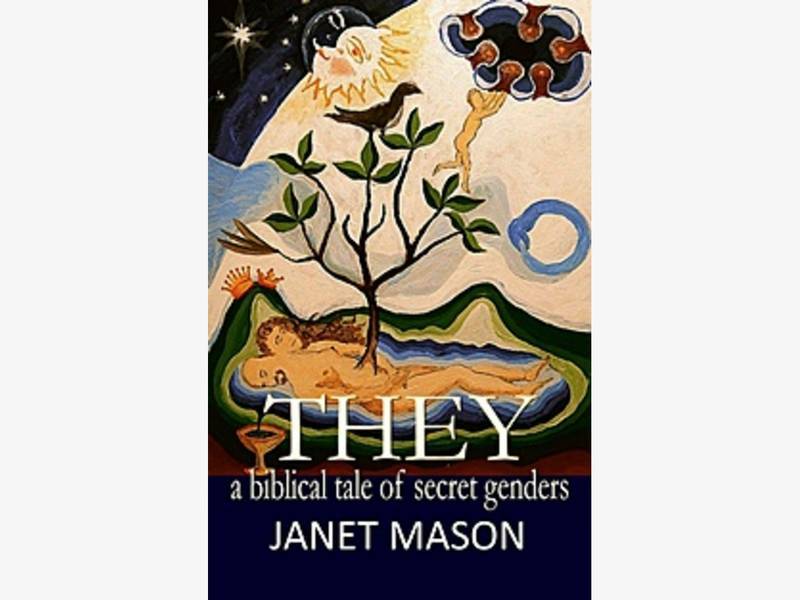 Airy resident and local lay minister and creative writing teacher Janet Mason recently published a novel titled THEY, a biblical tale of secret genders (Adelaide Press: New York/Lisbon). Mason, who teaches creative writing classes through the Mt. Airy Learning Tree and Temple University Center City, was nominated for a Pushcart Prize for a section of the novel. She is giving her launch reading at the Big Blue Marble bookstore (on 551 Carpenter Lane, Philadelphia 19119 — in West Mt. Airy) at 7 pm on the upcoming Thursday evening, July 26th . “Whoever heard of a divine conception?” Tamar rolled her eyes. She looked skeptically at her twin. Tabitha wrinkled her brow and looked thoughtful. Outside, the wind blew. The black goat skin walls shook. In the middle of the tent, the pole quivered. Stacked in a pile, clay pots rattled. One of the Patriarchs might have said that the gust of wind was a sign from God. But Tamar knew better. It was spring. The winds were on them. Anyone who even thought of venturing forth knew that sandstorms would drive needles into their eyes. She didn’t fear God, but she did fear the wrath of the villagers. Please join us to help Janet Mason launch her new novel! THEY, a biblical tale of secret genders weaves Biblical, Pagan, fantastical and modernist roots to create a world where gender is as complex and fluid as the emotional bond between twins. Janet Mason is a talented and honest writer. Her relationship with her own mother was not perfect, which of course is what makes the book interesting. More interesting is the fact she is willing to explore the imperfections without dwelling on them and becoming one of those victim writers whose memoirs I can never quite stand to read. Life is hard. Being a mother is hard. Nobody’s really ready for it when she gets the job, no matter how much you might have read or planned. It’s just not like anything else, and you can’t really prepare. “You will find this book helpful in thinking about your relationship to your own mother or daughter.” — Ruth Mountaingrove, Sinister Wisdom 87 — Tribute To Adrienne Rich. Mason wondered aloud if women artists suffer marginalization in the art and media fields. “Yes,” she concluded – a feeling filmmaker panelist Nadine Patterson confirmed with statistics from the Geena Davis Institute on Gender and Media revealing that for every 4.8 men working behind the camera in the film industry, there is only one woman. 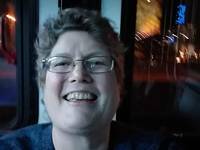 But Mason, who described coming out as a feminist and then as a lesbian in the 1980s, urged her peers not to be discouraged by a lack of representation. “It’s important to keep getting our work out there,” she said. “This Way Out Queer Life and Literature” commentator JANET MASON’s book tour for her memoir, “TEA LEAVES”, has taken her to some North American cities, but to get to Australia she had to “fly” by phone. On the other end was GORDON WILSON at Joy 94.9, Melbourne’s gay and lesbian radio station. LGBT baby boomers caring for their aging parents is a major theme of Janet’s tale of mothers and daughters, so Gordon zeroed in on Janet’s own experiences taking care of her mother during her final months of life. –This Way Out —click here to hear the interview and This Way Out newswrap. (scroll down to the bottom of the page where Tea Leaves is mentioned next to an mp3 link. Tea Leaves, a memoir of mothers and daughters was selected by the Lambda Literary Foundation for a bookclub of the month selection. Click here for Discussion Questions. The Lambda Literary Foundation book club is featuring Tea Leaves as its September selection. “The drafts [of ‘Tea Leaves’] are like layers of a painting — some parts have been there from the beginning when the memoir focused more on my relationship with my mother. Some of the pieces were painted on top of that – such as when I revised it to contain more of my own life experiences. Mason’s ability to bring the reader into her own experiences leaves the reader with an ignited interest in unspoken voices. How many women’s stories haven’t been told in your family? Let “Tea Leaves” start the conversation. Who knows what you’ll see. To read the full article, click here. Poet and writer Janet Mason’s Tea Leaves (Bella Books), subtitled “a memoir of mothers and daughters,” details her working-class upbringing in Philadelphia and the strong relationship she had with her mother, which made her coming out process a positive one. Tea Leaves is number two on the best-seller list (from Giovanni’s Room) just published in the Philadelphia Gay News! 2. “Tea Leaves” by Janet Mason (Bella, $15.95 pb). A memoir of caring for her dying mother and the deepening of their relationship. Despite my mother’s feminist activism, she was in fact a conventional stay-at-home housewife for most of her life. She referred to herself as part of the silent majority. She was, however, very much her own person. She said that she voted with her dollar. She participated in many boycotts. In her later years, she took petition to senior centers to get signatures to improve the Social Security laws. My mother believed in the possibility of change. She also had a sense of self worth. “Ask and you shall receive” was one of her favorite sayings. As she stood next to the stairs, leaning both hands on her cane, she looked at me keenly, as if looking into my life and beyond, back into hers. My mother stepped out with her left leg, shifting the weight that she was leaning on her cane. She braced herself against the wall again, reaching out with the cane to retrieve her other sneaker. After she pulled it over next to her foot, she looked back up at me. –article by Janet Mason in On The Issues Magazine. Although Mason said she believes many people experience what she wrote about in “Tea Leaves: a memoir of mothers and daughters,” it’s not a topic often explored. On a trip to Giovanni’s Room, Mason’s mother, Jane, began perusing a poem Mason had written for an anthology of lesbian eroticism. The book addresses themes of mothers and daughters – and stories that take place in Germantown where the author’s mother lived as a girl. Tea Leaves also includes a backdrop of Philadelphia history including the textile mills in the Kensington section where Mason’s grandmother worked as a spinner and the Lighthouse in North Philadelphia, which in the 1920s was a charitable day program for the children of single mothers, most of whom worked in the textile mills. Westchester artist Maggie Ploener was joined by author Janet Mason and musicians Lee Kelly (on guitar) and Barbara McPherson (on percussion) at the opening of her show “The Sacred Dance” on August 5th at The Peekskill Coffee House. The exhibit is running for the month of August. Her mother’s photo, taken at age 9, is on the book jacket. “Tea Leaves” author Janet Mason shares her book with community. When Janet Mason’s mother was diagnosed with fourth-stage cancer, Mason did what any loving daughter would do — she became her mother’s caretaker. But the months she spent caring for her terminally ill mother left her with more than she expected. It became a learning experience about her family, complete with stories about her mother’s life as well as her grandmother’s. Long time Northwest Philadelphia resident Janet Mason read from her latest book, Tea Leaves, a memoir of mothers and daughters, (Bella Books) and conducted a discussion and writing workshop Friday afternoon, September 7th, with the members of the Journey’s Way writing group that meets every two weeks. Journey’s Way, a program of Intercommunity Action, is a 55-plus community based on Rector Street.